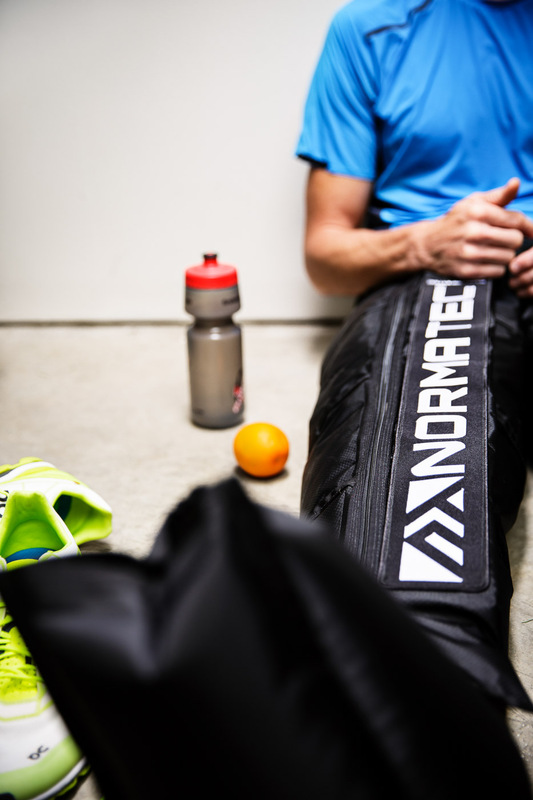 It’s no secret that I love getting to work with and photograph the extremely talented and hard working Ironman athlete Matt Hanson, so when his sponsor, NormaTec, reached out and wanted to set up a photoshoot with Matt in his own backyard I was stoked. This is also why I preach about having solid relationships with the athletes you like to work with. If they like to work with you in return, they’re more likely to bring your name up with their sponsors are wanting or needing new shots of them for marketing materials, and that’s exactly what happened here. It just worked out perfectly because I was heading back home to Iowa for a quick visit and could take my gear with me to bounce over to Storm Lake and do the shoot one day. Easy right? The morning before we were supposed to fly out of Houston I woke up around midnight with an extreme fever (102ish) connived that I could make myself break it before I had to wake up in a few hours and load 100lbs of photography gear, myself, and my 8 month old son onto a plane with just the two of us. I slammed some Nyquil, drank it down with a large glass of orange juice, ate a spoonful of honey, and crawled back into bed under about 6 blankets trying my best to crack the fever before I woke up. It was a MISERABLE night, but somehow I woke up “feeling alright” and got Cullen and I up to Iowa on the Thursday before our Saturday shoot with only a limited amount of stress and discomfort. After getting to Iowa, I assumed it was going to be smooth sailing. I had a shoot for a personal project lined up on Friday and Sam was going to join me in Iowa after she got off work on Friday and flew up to Iowa on the evening flight. Everything went through fairly smoothly although I still was trying to recover from my night of hell only two night prior. Shoot day was on Saturday morning early, and my buddy Pat was going to ride over to Storm Lake with us before dawn and assist on the shoot. I woke up at 4:45am on Saturday morning and my fever had returned with vengeance. I tried my best to put it off and out of my mind, telling myself I’d feel better after a cup of coffee and a shower. We piled all of the gear into a small rental car (somehow! lesson learned: get a large SUV) along with the 3 of us and set off for the Western side of the state. The fever didn’t show any signs of breaking and I continued to feel like I’d been kicked in the head by a mule the entire drive over, constantly going over the shoot plan and refining the shots we wanted to get and how we wanted to create them. We started off on a pretty typical farm road outside of Storm Lake that would be part of Matt’s typical training ride outdoors. I used the sun to backlight Matt and utilized a Profoto B2 with the Profoto Collapsible Beauty Dish for the main light boomed out of the truck like I’ve done numerous times previously. (Again, please don’t do this at home. It is dangerous and can have life threatening consequences should you fall or have an accident.) With everybody in and secured and with Sam piloting the new GoPro Karma drone we had just purchased to try and give some new BTS perspectives, we rolled out. On the first stretch of road, my goal was to get some wide shots and utilize the sun, shooting with my Canon 5D Mark III and the Canon 16-35mm f/2.8 II lens at around 16-20mm focal length. The goal here is to get wide enough that you’re pulling your subject into the image, but not so wide and outside that you’re creating some really weird stretching and skewing due to lens distortion. There’s a perfect place in the frame where you get that beautiful bend of the wheel and still have the rider and the rider’s face in a relatively un-distorted manner that is still pleasing to the eye. On the ride back in, towards the sun, I tried to switch things up and use the Canon 70-200mm f/2.8 II IS telephoto lens to get some really tight crops and essentially create a portrait of Matt on the bike. For this, I was using the sun as the main light while still utilizing the beauty dish to fill in some of the harsher aspects of the sun and present a more pleasing light on Matt’s face. We completed a couple of circuits of this and tried a few other shots that I wasn’t quite as happy with before switching things up and looking for a place to shoot running. This is where I decided to try something I had never really done before, and the entire idea came about from the fact that I couldn’t keep up running with Matt without a camera in my hand, nevertheless try to do it with a camera and trying to compose and keep a steady hand at the same time. The reason I wanted to be moving with Matt is I’ve never really been completely pleased with the effect of shooting a runner from a stationary position while they ran past and were lit. It’s always looked just a bit off to me because the motion and the blur is in the runner and the background is still. I like shots that give a sense of movement because the runner or athlete is still in the frame and the background is moving. This is the way your eye sees is when you’re ACTUALLY running, and I’ve always appreciated that perspective rather than that as the spectator. It draws me into the image more and gives me a larger sense of movement. 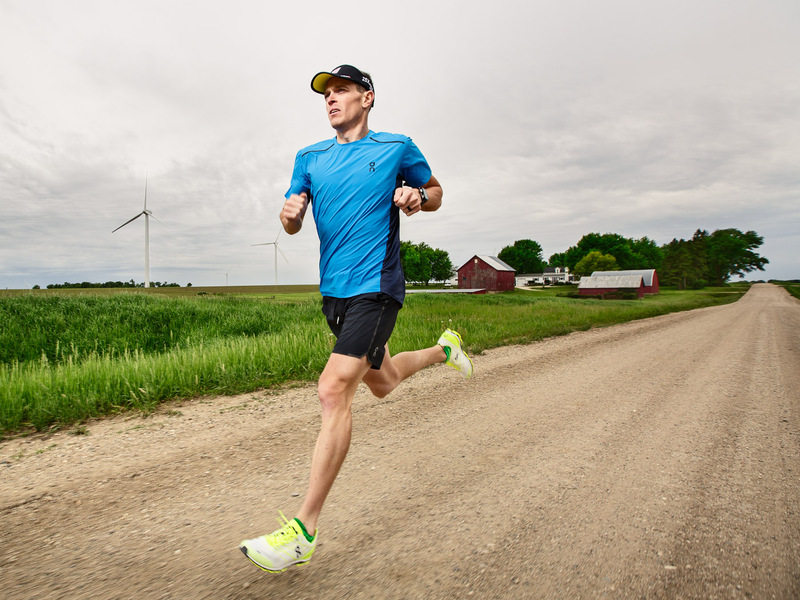 So, I used the exact same setup I’ve used countless times for the bike and had Matt run beside the truck at his normal clip of about a 5:45/mi pace… easy right? The results were better than I expected, and the bonus was that we were able to find a picturesque barn and some windmills to really convey that sense of “Iowa”. Now, if only it had been the middle of Summer or Fall and we could have gotten some tall corn to really finish the image, that would have been PERFECT. But, alas, we still captured something that, as an Iowan, I could appreciate and immediately see as ‘Iowa’. This was probably one of my favorite images we captured of Matt in action of the entire day. After wrapping that running portion of the shoot, I was absolutely destroyed, shivering, and just trying to keep my mind focused on what we still needed to do. Fortunately Sam was there to help push me through and keep the car heater running on full blast for me. When we got back to Matt’s he made me another cup of coffee and we all took a second to warm up before we moved on to the second stage of the shoot in his ‘pain cave’: the garage. 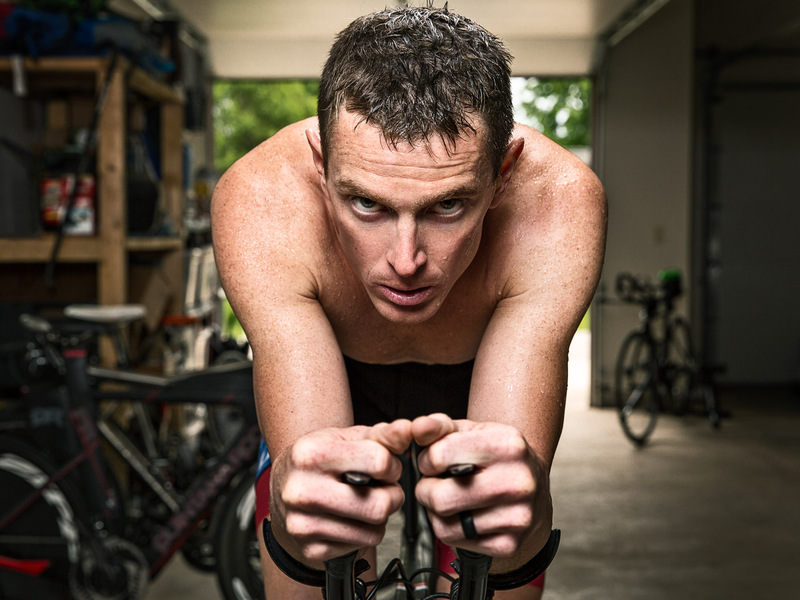 The garage portion of the shoot is probably the most real for many triathletes and Ironman athletes, so I wanted to really make the images convey a sense of grit as that style of training is an absolute grind that all athletes know. You’re putting in countless hours in a stationary position sweating and trying to maintain the mental fortitude needed to complete the hours-long session you’re putting your mind and body through. Then you get up the next day and do it all over again. I wanted to pull the grittiness through in the imagery with sweat and determination and a lighting style that could convey it. 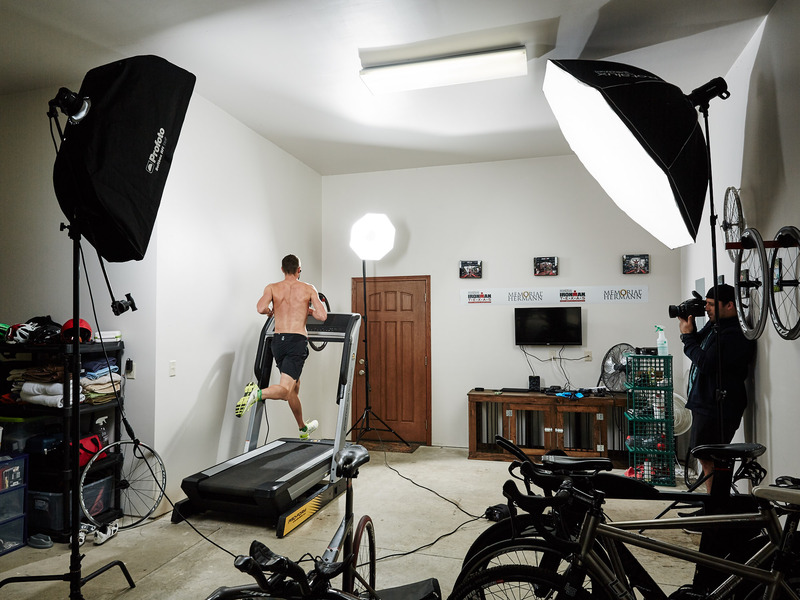 So, utilizing the Profoto Collapsible Beauty dish again and a Profoto 4’ Strip Box with a Grid, I set about lighting Matt on the bike first and then moved to the treadmill. 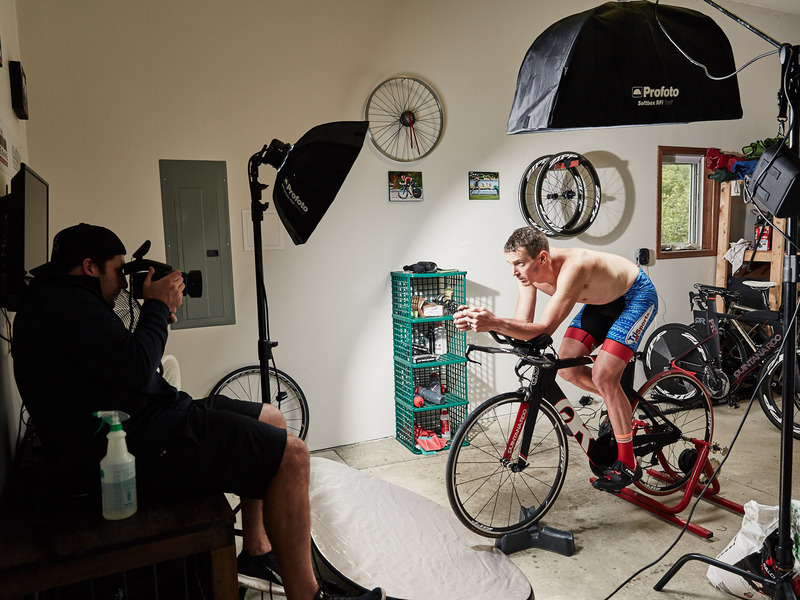 The bike shots were lit with the dish as the main light in front of Matt and the strip box as a top-down light on a c-stand to really light the body lights and sweat in a punchy, yet visually appealing manner. I shot with both the Canon 5D as well as the Mamiya 645DF+ and Credo40 back so get a few different perspectives and image files to play with. The medium format really captures all of the detail in the skin, really showing the sweat and the dirtiness of the image, while the Canon allowed me to use a wide angle and really get into Matt’s space and bring the viewer into the cockpit of the bike with Matt while he’s grinding away. 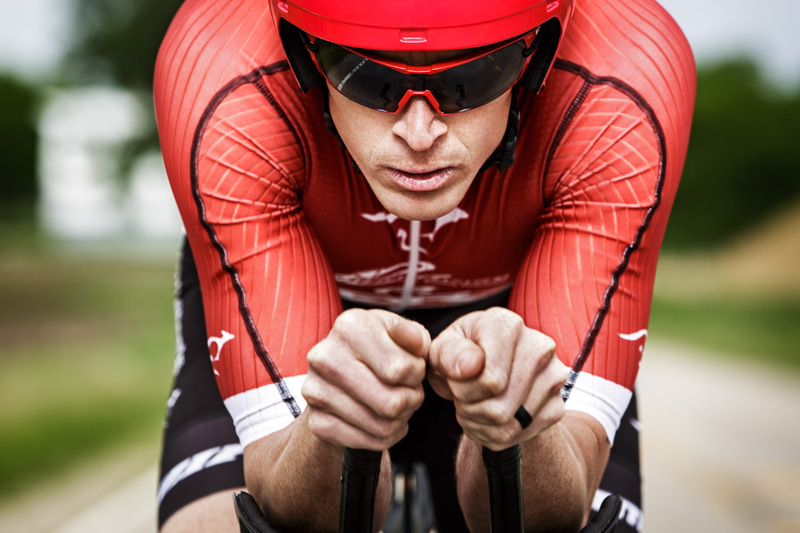 To convey the sense of the ‘pain cave’ I actually had Matt crank it up a bit and give some effort, and gave him the direction of that feeling you have when you’re cranking on the big gear to try and give those last efforts at the end of an intense workout. He brought it hard and the images were exactly what I wanted: intense, dramatic, isolating, gritty, and – most of all – isolating. 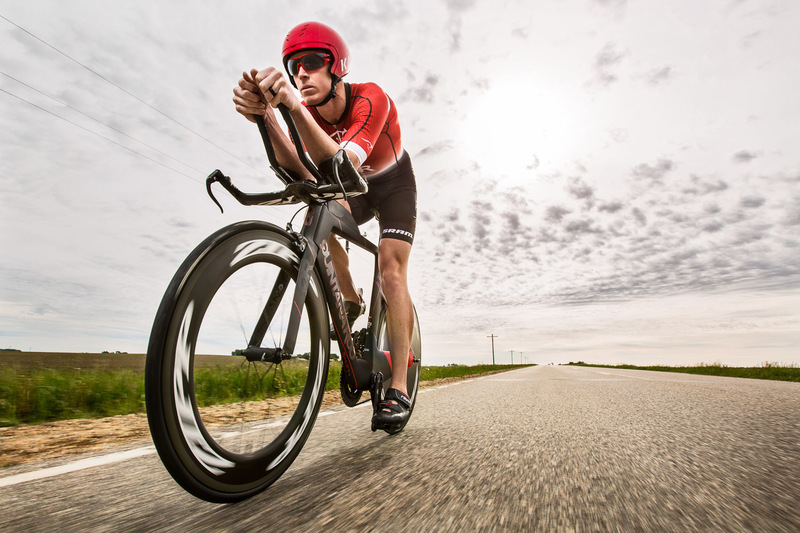 These workouts can be extremely lonely and isolation and I wanted to bring that sense as well of Matt, as an athlete, just beating himself and bettering himself on the bike in his space. Next, we pulled Matt off the bike and set up a lighting scheme for the treadmill. I didn’t want to tear his space apart too much, so we left the treadmill against the wall which created some lighting challenges. The spill from the Beauty Dish used to light Matt from the front was creating a really ugly light on the wall and making the lighting extremely noticeable to any viewer. When I’m lighting, I try to avoid this as much as possible and create an image that our eye might see more regularly and utilize what’s called ‘motivated light’ that makes the image seem more ‘real’ and less UFO-esque. So, in order to offset as much of the spill as possible, I used my large Elinchrom 69’ Rotalux Octabox from where I would be shooting from the fill Matt and the wall with an evenly spread light. This reduced the light spill enough that I knew I could eliminate it in Photoshop which, in the state of sickness I was feeling at this point in time, was the best I could hope for. I try to nail light as much as possible in camera, but sometimes you just know you’re going to be doing some work on the backend. The third, and final, light in the setup was behind Matt so, again, accentuate the body lines of Matt striding out on the run. I used the Profoto Stripbox with a Grid again and had the light about 8 feet high and angled back down at Matt to create some drama int he shadows. 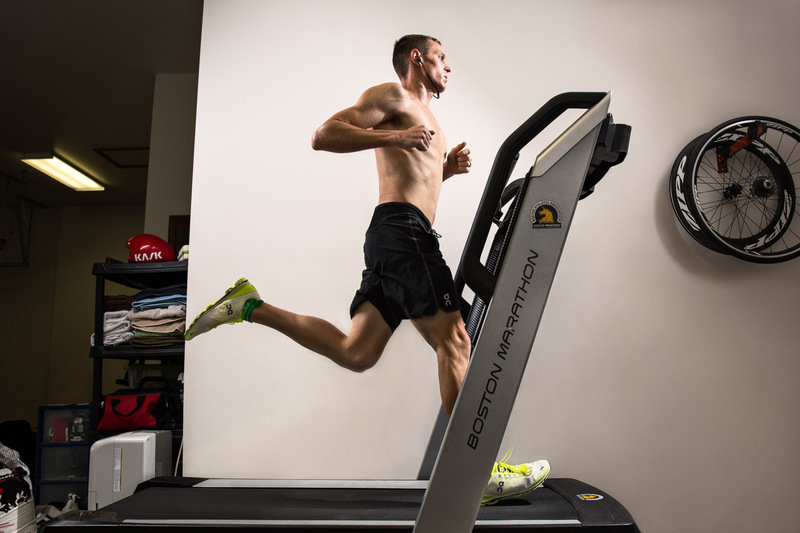 From there is was just having Matt stride out and find a comfortable speed on the treadmill to start shooting. I let him run for a few minutes to start getting a little pink in his cheeks and give the appeal of effort in the image before I started clicking away. Again, I used both the Mamiya and the Canon cameras, but I found I like the images from the Canon more here as they gave me a little bit wider view with the lens selection I have between the two platforms. 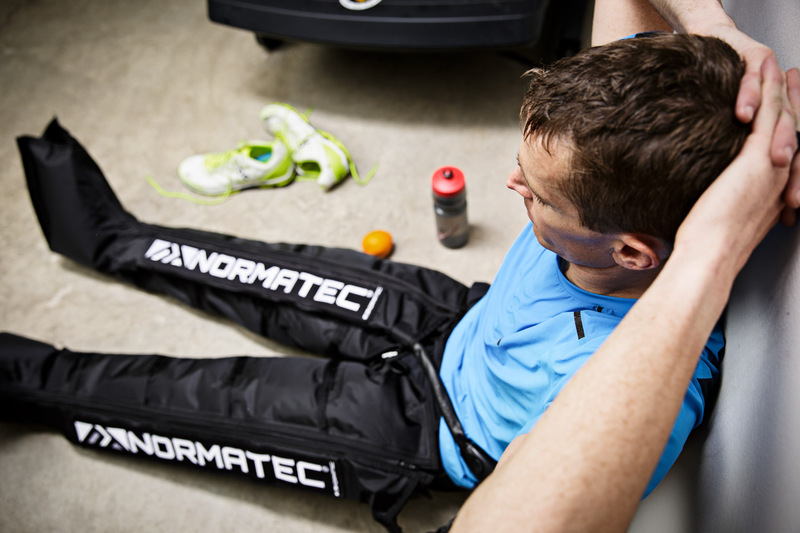 After we were finished, it was finally time to introduce the NormaTec recovery boots and get some shots. I wanted the stories to tie together, so we planned two different shoots. The first was going to be in the garage again with Matt on the floor, in the boots, recovering right where he was training and looking equally as disheveled and devastated from the effort he just put in. 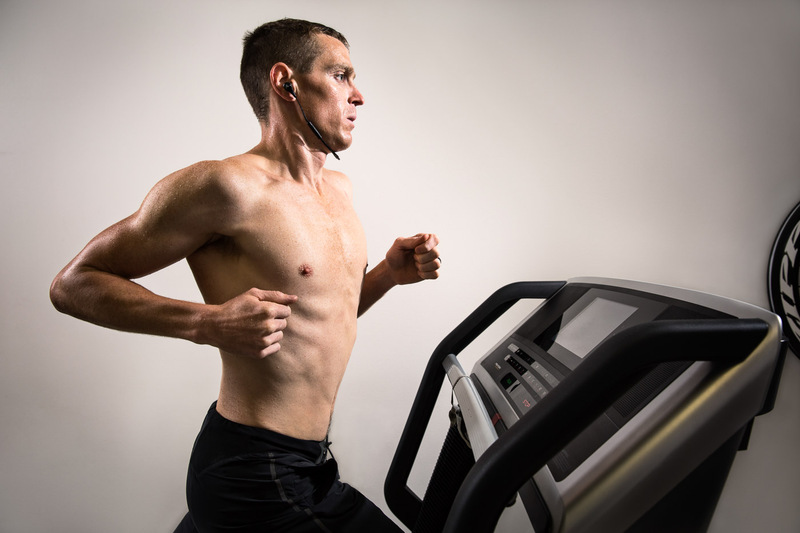 We added to the idea by having a quick recovery drink and snack by his side as well as the edge of the treadmill and the hint of a bike rim in the frame. At this point, however, I was so sick that I could barely think straight anymore. I had rehearsed in my head and on paper enough with the lights that I knew what I wanted to accomplish, but I needed some help really coming up with some different shots for the composition and getting some creative angles. Up to this point, I had always wondered the “what if” question on being sick the day of a shoot that really couldn’t be rescheduled for any reason. It had plagued the back of my mind so many times and it was finally presented to me in the realest way possible, and I found my answer. First, you persevere and persist as much as possible because you have a job to do and you HAVE to nail it. The other thing I found is that you have to have a team around you that you can trust to help you achieve the desired result, no matter the circumstances. As much as photography seems to be an individual endeavor, it is absolutely a team sport. Your assistants, make up artists, digital techs, grips, and creative directors are just as much a part of the team and the process as the person pressing the shutter, and I found that out sitting in the garage in Storm Lake, Iowa. I gave some direction and continued to try and give feedback and create, but it was my wife being able to step in and help provide some outside direction and angles that helped me recharge and find the ability to create the images we needed to be able to present the client. I cannot thank her enough for this, and if I hadn’t had her help and known I could trust her with this project, I don’t think the results would have been as positive as they were. We nailed the shots with Matt in the garage and moved to the final images of the day. It was about noon and I think all of us were tired at this point, but we got Matt on the couch in his living room, did some minimal re-arranging, and brought his bike in to act as the tie-in for our story. 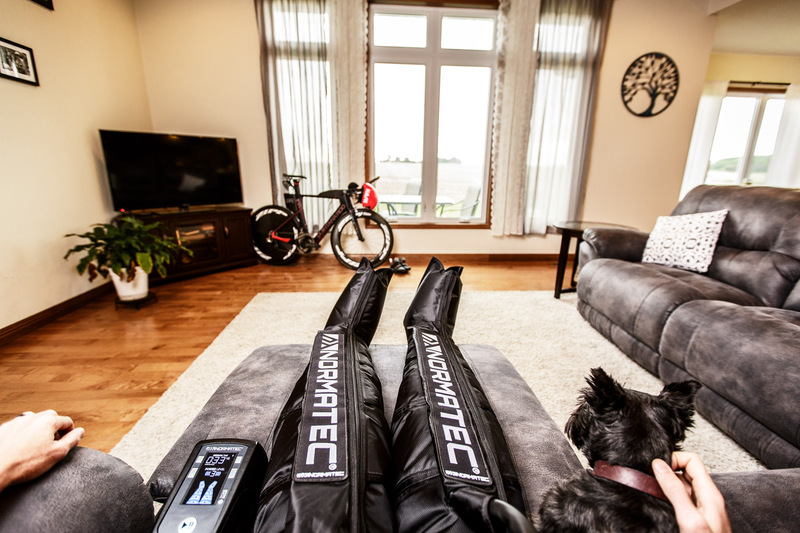 The idea was to have Matt in his training gear, in from an outdoor ride, and enjoying some couch time in his NormaTec Recovery boots along with his recovery beverage of choice – a cappuccino – and getting some recovery help from his faithful companion: his dog. We shot a couple of different perspectives, but the one I really loved was from Matt’s perspective looking down his legs and at this entire ‘recovery’ setup. It brings the viewer into the image and helps them see themselves in the boots as a potential buyer. The lighting for these shots was extremely simple: 1 light with a large octabox overhead and to camera left to spread some even light across the room. I was also sure to turn off all of the overhead lights so we didn’t have any spill from other manmade lights that could create a weird cast to the images. With the images on the card, we loaded up and headed off back for Marshalltown with my sick and tired body completely unloaded in the passenger seat trying to recover. This is still one of the most difficult photoshoots I can ever remember being on because of how I felt, and it showed me to never, ever take for granted how essential your team can be to the success of a photoshoot. I know it’s cheesy, but teamwork makes the dream work. Want to see more from this shoot and plenty of others? Check us out on YouTube, Instagram, and be sure to hit “Subscribe” at the top of the screen to be added to our monthly Newsletter and be the first to know about upcoming workshops and exclusive Behind The Scenes tips and tricks for business and photography! First of all! Love the picture and the story. The first shoot on the bike, what settings did you use if i can ask? Shutterspeed. And the flash? full power? Anders – Thanks for asking! It’s been a little while, but I want to say I was at about 8.8 on the power so not quite full but pretty close. The sun was still rising and a bit behind the clouds so I didn’t need the full 250watts for the image and I was at f/8. Because I was moving with the subject I didn’t utilize the HSS technology in the B2 system, instead shooting at 1/250th on the shutter at ISO 100. Hope that helps!